The generation of ZOTAC GAMING GeForce graphics cards are here. 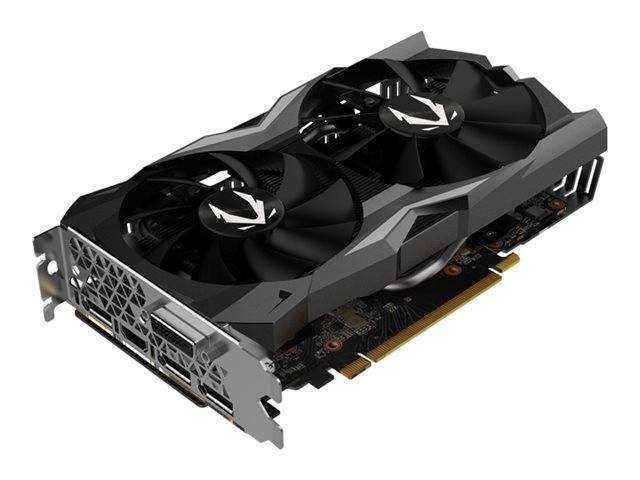 The powerful GeForce RTX 2070 takes advantage of the cutting-edge NVIDIA Turing architecture to immerse you in incredible realism and performance in the latest games. The future of gaming starts here. This revolutionary architecture, combined with the GeForce' RTX platform, fuses together real-time ray tracing, artificial intelligence, and programmable shading. You've never created and enjoyed games like this before. Less heat means more performance and their cooling engineers optimized the graphics card heatsink further to allow it more cooling performance. A larger and thicker aluminum fin stack array in combination with five 8 mm copper heat pipes, which four are straight, work in harmony to extract more heat than previous generation designs. The graphics card is only stronger in durability. An additional die-cast metal jacket layer with full board coverage adds an integral structural strengthening and as a plus, additional heat dissipation. Together with a redesigned wraparound backplate, it brings comprehensive support to the AMP EXTREME models for sheer protection. Introducing Active Fan Control to enable smarter fans. Two individual fan controllers allow users to adjust fan rotations independently and apply increased airflow only to where and when it's needed, reducing overall noise and increase longevity while still keeping things cool under the hood and performance going strong. It's all done automatically so there's nothing you need to do.